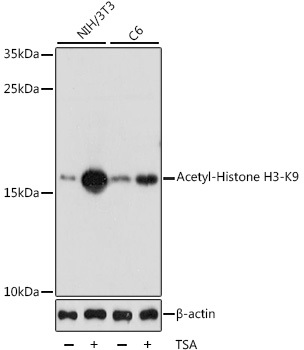 WB analysis of Histone H3K56ac (Acetyl H3K56) Polyclonal Antibody. Earn up to 285 reward points for this purchase! Histone H3 along with H2A, H2B and H4 is involved in the structure of chromatin in eukaryotic cells. Histone H3 can undergo several different types of epigenetic modifications that influence cellular processes. These modifications, including acetylation, phosphorylation, methylation, ubiquitination, and ADP-ribosylation, occur on the N-terminal tail domains of histone H3, which results in remodeling of the nucleosome structure into an open conformation more accessible to transcription complexes. In most species, histone H3 is primarily acetylated at lysine 9, 14, 18, 23, and can also be acetylated at lysine 56. 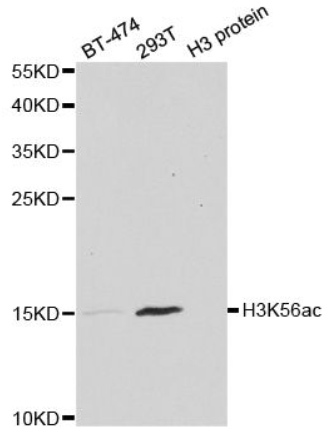 Histone H3K56ac (Acetyl H3K56) Polyclonal Antibody. Unconjugated. Raised in: Rabbit. Liquid. Buffer: PBS with 0.02% sodium azide, 50% glycerol, pH7.3 . von Walden F et. al. (August 2016). mTOR signaling regulates myotube hypertrophy by modulating protein synthesis, rDNA transcription and chromatin remodeling. Am J Physiol Cell Physiol. :ajpcell.00144.2016. Pal S et. al. (May 2016). The Commercial Antibodies Widely Used to Measure H3 K56 Acetylation Are Non-Specific in Human and Drosophila Cells. PLoS One. 11(5):e0155409. Zhang ZQ et. al. (April 2016). Epigenetic regulation of NKG2D ligands is involved in exacerbated atherosclerosis development in Sirt6 heterozygous mice. Sci Rep. 6:23912. Elhanati S et. al. (September 2013). Multiple regulatory layers of SREBP1/2 by SIRT6. Cell Rep. 4(5):905-12.